Potted review: The Town is an excellent, gritty heist movie that manages to effortlessly develop characters and plots. I like my heist movies gritty and personal. I’ll enjoy an Ocean’s 11 style romp but a character driven drama like Heat is what I yearn for. The Town absolutely falls into that genre. The Town’s strongest point is the excellent character development. Ben Affleck is really acting his socks off. 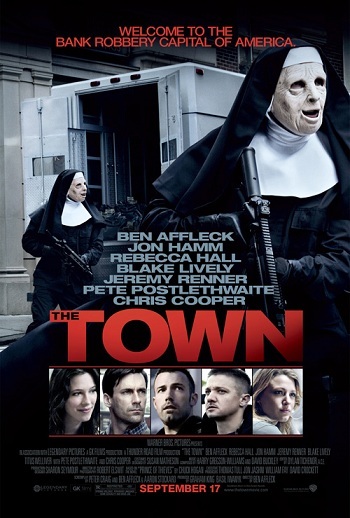 I don’t think I’ve ever gone out of my way to see a film because he’s in it but The Town may just have changed my mind about doing that in the future. As director he clearly knew what he wanted to do as an actor and he did exactly what he was telling himself to do. There is something of an animal caught in a trap about Doug MacRay. He doesn’t start out as a character who wants to do one last job. He develops into that character in a way that felt natural even if it happened quickly. Rebecca Hall’s Claire Keesey is also beautifully developed. She’s an outsider living in Charlestown and a victim. Heist movies don’t normally allow you to see the impact of the crime on its victims but in just a few scenes she manages to show us fear, shock, anger and so much more. Jeremy Renner’s portrayal of a clearly broken individual is excellent from start to finish. His character is summed up by a line from the film about his life being about Xbox and cocaine. He can’t walk away from the life and he doesn’t want MacRay to either but he’s not a cartoon villain who’ll kill his best friend either. The other two robbers don’t get a lot of development but we get what we need from their performances and through FBI Special Agent Adam Frawley briefing. Jon Hamm really worked as the Frawley. He’s not the main focus of The Town’s story. This wasn’t Heat with the Cops and Robbers getting equal development. He didn’t have a broken marriage or any back story to speak of but he hung his hat on the character and made him live and breathe. That was important because his character needed to be as strong as Affleck’s for the film to work. We see a deviousness and determination that let us know he will take MacRay down given the opportunity. Characters who barely had screen time felt whole and developed. Some of that had to be down to the exceptional cast. Character actors fleshed out the important characters that in a lesser film would have been allowed to get by without strong performances. Chris Cooper, Pete Postlethwaite and Victor Garber to greater or lesser degrees didn’t steal scenes they built them up. Boston, and especially Charlestown, is a distinct character in the film. There are moments where aerial shots, time laps and other devices are used to include it in the film but these don’t take on Michael Mann’s fetishistic approach that can get in the way of the visuals. Instead Boston is simply there in the visuals a lot of the time. One of the strongest musical themes was an interesting variation on the theme from the Band of Brothers TV series. It was used for the softer moments and worked well. I’ll put that down to the composers channelling the best of Michael Kamen into their work. The action sequence music was slightly generic but not to the point of being taken from a template. The action sequences are visceral. There is definitely something of Heat or Leon in their DNA. They just stay on this side of believable even when characters are unloading fully automatic weapons with extended clips. Confused situations are shown without confusing the audience. I could always clearly follow what was going on. The action had been thought about, then filmed and then edited to be both exciting and understandable. All three of the major heist sequences worked really well. There is always a problem for heist films if the action climaxes a little way before the end of the story. While The Town suffers from this a little thankfully it doesn’t drag on interminably tidying up all the plot threads it leaves hanging. To sum up: I really enjoyed The Town. It’s a real close tie between The Town and Inception for my film of the year so far (Inception probably just has it) – can RED give them a run for the title? For me it was better than The Expendables but if you like Stalone's style of action movie more than, say, Heat you'd probably like The Expendables more. So it was better than The Expendables?